An emotional Carol Burnett payed tribute to her good friend Beverly Sills on NPR this week. Beverly Sills died on Monday, July 2. I loved Sills's bubbling laugh and glorious voice. She was an American original. What fun! I fondly remember Beverly Sills' specials with Carol Burnett, but didn't know she dueted (sp?) with one of my favorites, Danny Kaye. I wonder if anyone (of BookMoot's "older" readers) remembers a record Kaye made of Aesop's Fables stories. I listened to it religiously as a child (along with Vivien Leigh's recordings of the Peter Rabbit stories) and loved the song Kaye sang for the story of the fox and the crow ("I'm a Cheese Man"). Thanks for the delightful clip! I had a Danny Kaye storybook of Stories from Around the World or something like that. I think there even may be a record of him telling stories at my folk's house. I will have to check on that. Kaye was another original. I used his "Vessel with the Pestle" bit from the movie Court Jester for notetaking lessons. It was important to me that kids today be introduced to his brilliance. You know, you don't even realize who or what informs your ideas on what things are... 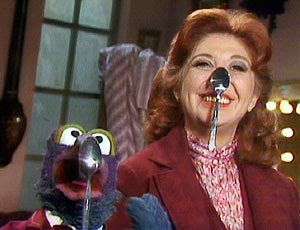 I got the idea of what opera was from Beverly Sills being on re-runs of The Muppet Show. When we galloped around the house ululating and playing 'opera star,' it was she whom we imitated. ...despite the fact that for years I called her George Beverly Sills... having once heard the name George Beverly SHEA. I realized my youngest daughter had never seen her when we watched a concert and tribute to her on PBS earlier this year, and to think, my youngest is "the singer." I am so grateful we took time to watch the program and enjoy her joy of singing.